August’s numbers are in for the local market update from the Charlotte Regional Realtor Association, and inventory is still down while prices climb. There are more new listings, but they can’t keep up with demand. 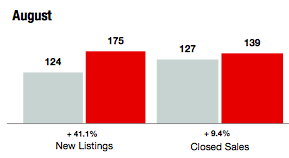 Stats for the entire CarolinaMLS area for August show signs of a very strong and active market. Year over year numbers indicate an increase in new listings, pending sales, closed sales, median sales price and average sales price. Plus, the total time that homes are spending on the market until sale has dropped. Furthermore, the months supply of inventory has dropped as well as the inventory of homes for sale. The same trends are present in Lake Wylie, where, for example, new listings are up 12.4% from 2015 and the months supply of inventory is down 23.2% from 2015. Fort Mill is seeing similar market trends, however new listings are up a dramatic 41.1%, and pending sales are up a whopping 74.5% from 2015. Furthermore, the months supply of inventory in Fort Mill is down 19.4%, which is not nearly as significant of a drop as what we are seeing in the CarolinaMLS area as a whole, where the percentage change was approximately 30%. 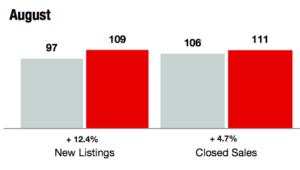 In general, the decreasing inventory has created a seller’s market where the average sales price continues to rise and the market is more and more active. Buyers are going to be forced to act more quickly as inventory continues to move and demand continues to grow. We will keep an eye on the numbers and the trends with the expectation and hope that the region’s real estate market and housing landscape continue to thrive.